Whoopee! was a British comic that ran from (issues dates) 9 March 1974 to 30 March 1985, when it merged with Whizzer and Chips. It was published by IPC Magazines Ltd. and ran for 572 issues. The first issue of Whoopee! ran to a generous forty pages, with a free gift in the form of a ‘squirter ring’. The strapline exhorted potential readers to “Get happy – get this paper!”. Shiver and Shake merged with Whoopee! shortly after its launch in 1974, followed by Cheeky in 1980 and Wow! in 1983. Whoopee! annuals continued to appear well into the late 1980s, and a Best of Whoopee! monthly reprints comic was published for a few years in the early 1990s. Willy Worry – a boy who misunderstood simple expressions (e.g. “I can see right through you”), taking them literally and worrying about the consequences. Whoopee had a total of 14 Annuals as follows, from 1975-1987 and then later 1 in 1992. Whoopee had a total of 19 Specials from 1974-1992. 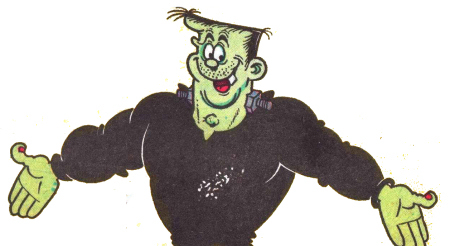 Whoopee also printed Special Annuals And Special Specials of Frankie Stein, they are as follows : WHOOPEE! FRANKIE STEIN Annuals 1976 and 1977. Whoopee! Frankie Stein Specials from 1975-1982. In case Annual 1976 is corrupt you can download this annual. In case Annual 1979 is corrupt you can download this annual. A new link for a complete Annual 1985. Thanks, i made 2 new links for these issues. Thank you for your swift reactions. No problem, thank you for taking the time to inform me about errors. Coming to you soon Whoopee! Annuals 1980, 1981, 1983, 1987, and 1992. Being prepared for you. when ready, I let you know again. whoopee! Date and Numbering Guide of all Comics, Annuals and Specials now ready in dropbox. Whoopee Annuals 1980, 1981, 1983, 1987, and 1992 are now being uploaded.